Looking for a hearty beef stew? This recipe won’t disappoint. 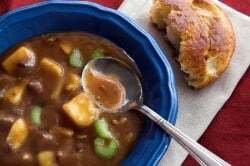 By layering flavors of beef stew helps make this soup taste very rich. Be sure to serve with some garlic bread. You can make the Plaza III steak soup at home. Place the butter in a soup pot and allow to melt without browning. Add flour and stir to form a smooth paste. Cook the mixture over medium heat, without browning for 3 minutes, stirring constantly. Add the consume to the roux and stir until smooth and lightly thickened. Bring to a full boil. Add the fresh vegetables, tomatoes, and seasonings and allow to regain a boil. Reduce the heat and simmer until the vegetables are just barely tender. (This should take about 20 to 30 minutes.) Add the frozen vegetables and browned ground steak. Simmer an additional 15 minutes. This was a little salty for my liking. I’m almost sure it was made with steak of some sort too vs. ground beef. No,it was definitely ground beef. Are you sure the REAL Plaza III Steak Stew Soup was made with Ground Beef? I thought it was made with Round Steak. This was a hit in my house. The guys loved it!